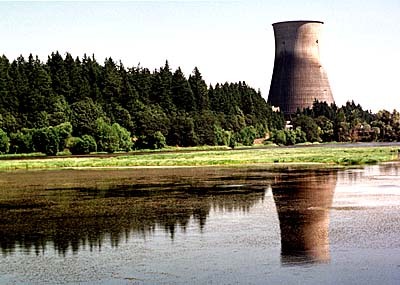 The infamous cooling tower on the Oregon side of that north- flowing segment of Columbia, is these days being stuffed with dynamite in preparation for the big blowup next week. Per The Oregonian, traffic will be stopped on both sides of the river, plus overhead. People are welcome to stay home and watch everything unfold via TV's carefully controlled control rooms. Future OPB type documentaries about Trojan might want to follow my trail through Asia Pacific Issues News (APIN), a regional intelligence journal I co-edited (apprenticing under Paulette) and then pretty much soloed for AFSC, way back when Belau was still a nuclear free zone (the USA State Department took care of that defiant lot, re-enjoined 'em to slavery with the usual promises of easy money, and over the objections of the activist voters (since when did we listen to women, anyway?)). Various prefectures in Japan were all up-in-arms about the microfractures developing in their Trojan lookalikes. The discussion here in Oregon, on the other side of the Pacific Rim, was far less technical in nature, but just as charged politically. And of course this was really a lot about Chernobyl. People now knew it could happen. 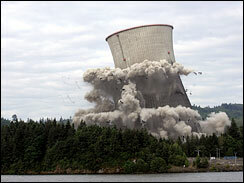 Three Mile Island had also been close. The Columbia is famous for its nuclear icons. Putting on my Chamber of Commerce hat, I have to say I'm a little sorry our decommissioned Trojan won't be around to haunt the scene, as a ghostly reminder of Homer Simpson's day in the sun. Hollywood may end up burning millions merely to recreate it, as a great backdrop for more of those "day after" nuclear meltdown type scenarios. But we still have Hanford, aka the historic site of the Manhatten Project (more links to Japan). No one knows how to shred the memory of that one, especially given it's a very active official superfund disaster, with all the gory details (well, some of them) on display in the public area at OMSI and/or on 60 Minutes. Then we have the nerve gas stash near Hermiston. Ecotourism anyone? You too could pay the big bucks to study the folly of man, and, more to the point, our extensive (and expensive) cleanup efforts. How're we doing, in your estimation? Maybe take a few lessons back home? About how not to do things in some instances?